The film “HEAL! Veterans Speak About PTSD,” is the first in a series of forthcoming short docs by visual artist Vicki Topaz from her larger project entitled HEAL!. The film shares the stories of service members who suffer psychological trauma from active duty, combat, multiple tours, military sexual trauma, or survivor guilt, all of which are contributing to the alarming rate of 22 veteran suicides each day. This film was an official selection of the GI Film Festival 2014 in the DC Metro Area, My Hero International Film Festival, the Bakersfield Film Festival, and the Animal Film Festival. HEAL! is a multi-media project that employs photography, short films, in-depth interviews, and a dedicated website to help promote discussion and foster understanding about the psychological issues veterans face, such as post-traumatic stress disorder (PTSD), traumatic brain injury (TBI), and other hidden disabilities. The project advocates the use of service dogs as a complement or alternative to drug and other therapies and aims to help bring awareness of this treatment option into the mainstream. 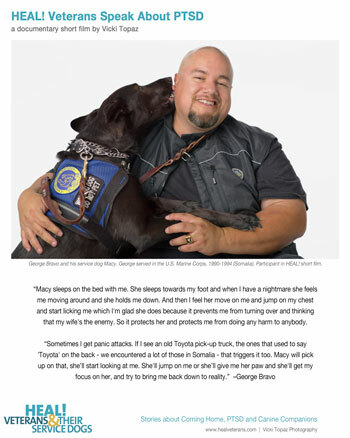 Service animals as a tool for recovery provides veterans with a new mission – to heal themselves. This shift in focus helps bring veterans out of isolation, reunites them with their families, and helps them integrate back into their communities. As stories and imagery from HEAL! circulate, veterans in need can learn about how the human-canine bond is a path for hope and healing, and see that there is no shame in asking for help. Visit HealVeterans.com for more information.